“We are in business to make money” is a common mantra, and it’s true that without money a business will soon die. But if it’s the prime focus then its going to be a tough journey for all concerned. 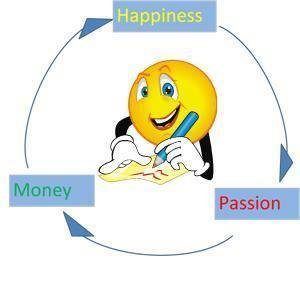 What happens for many people is that they believe happiness will come when they have money, so they strive to make every last dollar in the business. Customers feel this, and have a sense that they are not getting good value. There is the constant need to attract new customers to replace those that leave. The customers that stay are …The money focused customers who fight to get the price down, or worse don’t pay. The staff know its about the money, and become infected with this attitude, except its not to make every dollar for the business that is important. Rather, it is “the boss is greedy, so I want my share too”. In this situation everyone always wants more money for less effort. The thinking is:”When we have enough money we will be happy, and then we will be passionate about our job”, unfortunately as happiness is never reached staff never become passionate. Someone who is happy in themselves will do a few things that lead to success. They will treat people well e.g. staff and customers. They will attract people to them because they have something others want. Being happy they are content with their lot in life so do not come across as needy or greedy. They do however have a strong sense of self worth and are prepared to ask a fair price for their skills. A happy person acts with passion, so when in business they just do what’s necessary to make it work. Why? Because that what they feel like doing. This passion rubs off onto staff, who are happy to do anything for a happy, passionate boss; they feel they are involved in something worthwhile. Customers just arrive, as they see they are being looked after and given good value. So we have– staff that want to work, Customers that arrive of their own accord. The two big problems in business are suddenly gone. No staff issues and plenty of loyal customers, who are happy to pay a little extra for the great service. The business can’t help but make money! Of course now the money is flowing the business has the resources to do an even better job (note not just give it all to the staff, or pay excessive directors fees) and the cycle repeats. Focus on being happy, and having happy people around you. Recognise people for what they contribute, not what they lack. Don’t offer extra money, offer extra heartfelt thanks. Pay yourself along with the staff– nothing kills happiness like no reward for effort. Get back to the passion that got you started in business in the first place. Keep a tight reign on finances as a measure of progress, not just as the goal.